Includes Tetron S Pipeline, Tetron S U-cut gaskets and Tetron S V-cut gaskets. TETRON S is the trade name of virgin polytetrafluorethylene (PTFE). 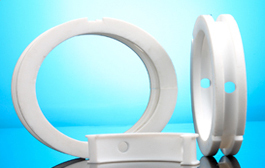 Virgin PTFE contains no fillers and has almost universal chemical resistance. It has excellent insulating capabilities and high dielectric properties. Its high temperature stability allows for continuous use at 260°C. TETRON S has excellent low friction, non-stick and release properties. Gaskets are an integral part of piping systems and their fittings. In corrosive environments the reliability of gaskets is of utmost importance, where gasket failure can have detrimental effects leading to system failure. Tetron S, which is the trade name for virgin PTFE (polytetrafluoroethylene) is resistant to virtually all chemicals and has excellent non-stick properties. The material also operates within a wide temperature range and is capable of continuous use at 260 C, thus making it the ideal material for the envelope gaskets. We are suppliers and stockists of an extensive range of envelope gaskets. The IBC envelope gaskets are manufactured to British standards with nominal bores ranging from 15mm to 600mm. Customised requests are also welcome and further enquiries can be made at any one of our branches throughout Australia. Material is milled or machined out between leaves to form a U shaped space for the filler. The filler is flush with the envelope which is flush with the pipe, permitting free flow. Tetron S, which is the trade name for virgin PTFE (polytetrafluoroethylene) is resistant to virtually all chemicals and has excellent non-stick properties. The material also operates within a wide temperature range and is capable of continuous use at 260°C, thus making it the ideal material for the envelope gaskets. A slit is made in the material forming a "V" shape space for one filler. The point of the "V" protrudes slightly into the pipe causing slight flow turbulence.